The challenges of John Baumgardner’s second submission are addressed. More information is provided from the ocean floor on the uniformitarian assumptions that undergird his belief in plate tectonics. Especially problematic are his wholesale acceptance of evolutionary fossil successions and magnetostratigraphy. I offer brief comments on several specific aspects of plate tectonics in particular Wadati-Benioff zones, mountain building and the space problem, thickened crust below mountains, the plate tectonics mechanism, the Zodiac fan, and spreading ridges surrounding Africa and Antarctica. Several unique features of catastrophic plate tectonics, such as the character of trenches, the heat problem, and pre-Mesozoic plate tectonics are questioned. A defence of my alternative suggestions is provided. John Baumgardner and I can agree on many aspects of Earth history, such as there was a global Flood, the Flood/post-Flood boundary is in the late Cenozoic (this is a welcome change from the Cretaceous/Tertiary boundary), the trench sediments are problematic for the standard plate tectonics paradigm, extensional features are ubiquitous around trenches, Wadati-Benioff zones are complex, and seafloor morphology is complex. We also agree that creationist cannot be careless in handling scientific data bearing on the subject, cannot indulge in building strawman illusions, should not pick and choose what data we address or ignore, and ‘ … must be discerning as we draw upon work done by researchers who view the world through evolutionary glasses’. I especially want to emphasize in this submission that we need to examine all the data thoroughly, since it usually comes from uniformitarian sources and may be either theory laden or not a complete data set. A more complete picture of the evidential basis for plate tectonics? Baumgardner states in his second section that I am not careful with the data and erect a straw man because I have failed to address the igneous crust of the ocean, the worldwide fossil correlations, ocean sediments and sea floor morphology. Although I have dealt with some of these aspects either in this forum or elsewhere and plan to continue analyzing all the data, I see the situation different. I disagree that all these features add up to seafloor spreading. For instance, I fail to see where a minute amount of lava added to the mid-ocean ridge implies seafloor spreading, especially in view of the new results that very little magma exists directly below the ridge and other complications mentioned in my second submission. Furthermore, not all mid-ocean ridges have a central rift graben, such as the East Pacific Rise. Is all basalt on the Earth derived from the mantle during seafloor spreading? Couldn’t some basalt also have been produced during Creation Week? Baumgardner surprisingly accepts the biostratigraphy of microorganisms and magnetostratigraphy at face value. These are evolutionary scenarios built upon uniformitarianism assumptions and, yes, radiometric dating, as shown in my second submission. Why should creationists accept these evolutionary fossil successions? There is much data manipulation in the construction of these evolutionary scenarios. For instance, claimed reworking is a common problem.1,2 Reworking likely is just an excuse to eliminate contradictions. It is possible that one or more fossil successions have general value for Flood geology, but this remains to be demonstrated. Baumgardner needs to justify his use of such uniformitarian assumptions and deductions within creationism and explain how his Flood model can result in an exact worldwide succession of microorganisms with time during the Flood. Baumgardner brushes off plate tectonic difficulties at the Wadati-Benioff zones by stating that these zones are complex, and that I am criticizing an imaginary problem. I prefer to look at all the data and their implications, instead of believing the simplistic explanations offered by plate tectonics enthusiasts for this problem. One difficulty in particular should cause advocates to pause, just a little, in their enthusiasm, and that is the average downdip first-motion of earthquakes at intermediate depth is tensional, when it should be compressional. Furthermore, thickened crust below mountains does not automatically mean that subduction has occurred. Although high mountains are generally in isostatic equilibrium, the main source of information on the thickness of the crust is seismic waves, the interpretation of which for the crust or mantle can have a range of compositions, densities and temperatures.6,7 There likely are other explanations for thickened crust, for instance the crust or upper mantle could be hotter or there could be more liquid magma under high mountains.8 In their interpretations of deep structure and composition, researchers often extrapolate high-pressure lab experiments on very small samples of various minerals to the natural world. Although these lab experiments can provide hypotheses, there are a number of pitfalls with such extrapolations.9,10 There is room for alternative interpretations besides subduction. Of course, it is catastrophic plate tectonics that is the subject of this forum, so I could not logically state that the driving force for supposed plate movement has been solved by Baumgardner’s mechanism when uniformitarian scientists are still uncertain. Baumgardner strongly defends most of the standard plate tectonics paradigm. Besides a rapid mechanism, where does catastrophic plate tectonics depart from plate tectonics? For instance, he believes that plate motion is continuing today. But why should plate motion be continuing when the mechanism for catastrophic plate tectonics has ended, and the Earth’s rheology is back to what it was before? I doubt Baumgardner would have developed his model if plate tectonics were not popular. It is essential that we go back and analyze reasons for this popularity, and examine how many of these reasons are grounded in evolution, uniformitarianism and radiometric dating. In regard to Baumgardner’s explanation of the Zodiac fan according to the standard plate tectonics paradigm that he defends, the fan would have been far to the southeast of its present position—about 1,500–3,000 km off the coast of the Pacific Northwest during the Eocene.13,14 Invoking an extinct but barely visible ‘spreading ridge’ to the east of the fan in order to displace the fan westward from off the southeast Alaska coast is quite hypothetical and ad hoc. This is typical of how plate tectonics advocates solve their many problems, and by my mentioning it, I am supposedly erecting a straw man argument and taking advantage of the ‘ … complexity of seafloor spreading and subduction …’. I fail to see the logic. The Zodiac fan makes much more sense as Flood runoff southward from western Alaska since the tapering thickness and north-south channels indicate southward flow. Since the fan is south of the Aleutian trench, the Zodiac fan indicates that the trench was absent while the fan was developing and, therefore, the trench would be a very late stage Flood feature. It also indicates that there was no plate motion between the Pacific and North American plates. The very late Flood origin of trenches is likely the reason trenches are not in isostatic equilibrium with large negative gravity anomalies. In regard to the problem of spreading ridges surrounding Africa and Antarctica, Baumgardner finally provides some details. I find these details far fetched. Although Baumgardner admits that the character of the trench sediment is a problem for plate tectonics, he believes he has solved it by catastrophic plate tectonics. I doubt that, and I would like to see his explanation fleshed out. If trenches were uplifted several tens of kilometres in his model, there should be copious evidence for extensional features in the sediments, but they are mostly horizontally layered in those trenches that contain sediments. Furthermore, it seems hard for me to believe that thick trench sediments would not accumulate after runaway subduction finished in the first 40 days of the Flood. Large lengths of the trenches west of Central and South America have little or no sediments in them.15 These trench segments are too close to the continents not to collect sediments after 40 days within the Flood. Baumgardner’s point of less heat generated in materials of less strength is well taken. Of course, the main heat problem is the resurfacing of 70% of the Earth’s surface with basalt extruded at a minimum temperature of 1,200°C. I would like to see Baumgardner model the flow and transfer of heat for this event. The hot lava may or may not be a problem for other Flood models, depending upon whether they believe all or most of the entire seafloor was resurfaced or not. Pre-Mesozoic plate motions, or Wilson cycles, are postulated by the plate tectonics paradigm. Continents have supposedly collided and spread apart several times in uniformitarian Earth history. For instance, the North Atlantic Ocean, called the Iapetus Ocean, was open in the Late Precambrian to Early Paleozoic and closed during the mid to Late Paleozoic, only to reopen during the Mesozoic and Cenozoic. Catastrophic plate tectonics accounts for only this latter event, if it occurred. Since the Paleozoic sediments are from the Flood, how would catastrophic plate tectonics advocates place pre-Mesozoic plate motions into their scheme? One of the themes of Baumgardner’s second submission seems to be that I do not have a mechanism and hence am disqualified from challenging plate tectonics or catastrophic plate tectonics. (It is interesting that evolutionists use the same tactic to disqualify any results from creationism.) Philosophically, I do not need a mechanism. I have suggested the alternative of slant-wise vertical tectonics with possible meteorite impacts, but I admit that it needs much more research and development. At this point, I can easily reject this tentative model. In regard to large meteorite impacts, they should have more than a local effect, and if the Earth was bombarded with several hundred or more meteorites during the Flood, it seems to me that the effect would be globally significant, likely in ways we cannot imagine. If just one large meteorite impacted the ocean, the resulting tsunami would be more than local. Many of these alternative ideas, such as the hypothesis of an orthogonal stress pattern for the mid-ocean ridges and 90° offsets and fractures caused by differential vertical tectonics still seems like a good hypothesis to me. Baumgardner states that for vertical tectonics to account for the pattern of the ocean floor, the ocean crust must be the same composition as the continental crust. I fail to understand his reasoning. Furthermore, I am in the same boat as the uniformitarian scientists in my lack of a mechanism for accounting for some of my ideas. In regard to the many features of the Earth that my alternative hypotheses have not explained, I would like to see a detailed explanation of these features in Baumgardner’s model that is careful with the data. I too believe we must handle all the data carefully, but we must examine our assumptions and make sure of the data we are attempting to utilize. I believe we are far from having a viable model of the Flood at this time, and that it is unwise to become locked into one model. Baumgardner needs to flesh out his model in much more detail and justify his assumptions and use of all aspects of plate tectonics. Of course, we do not need science to validate the Bible, but it would be nice to construct a viable model. I would like to see us young-Earth creationists ‘ … begin to pull together, communicating with one another, to bring to fruition a vibrant and credible defence for the hope that is in us, relevant to the time in which we live’. I hope this forum is one step in that direction. In the first submission to this forum, it was appropriate to point out some of the many problem and uniformitarian assumptions with plate tectonics, since catastrophic plate tectonics seems to be accelerated plate tectonics. I especially focused on various aspects at so-called subduction zones and showed that newer geophysical evidence was contrary to plate tectonics. These data include lack of trench sediment or horizontally layered trench sediment; terrestrial sediments in trenches and in the so-called accretionary prisms, which are anomalously small or lacking altogether; the enigmatic evidence for ubiquitous extension processes; the many plate tectonics problems associated with Wadati-Benioff zones; and the difficulties with plate tectonics explanation of mountains. I briefly mentioned several added problems with the catastrophic plate tectonics model, such as the problem of excess heat, supposed pre-Mesozoic plate motions, and copious post-Flood catastrophism. I then ended with a suggestion that slant-wise vertical motion, possibly with meteorite impacts, could have caused or been contributing factors in the Flood. In my second submission, I questioned the belief that plate tectonics has been proven and pointed out the many uniformitarian assumptions behind the catastrophic plate tectonics model, including biostratigraphy, magnetostratigraphy, and even radiometric dating. I focused on plate tectonic interpretive problems of mid-ocean ridges and magnetic anomalies, providing an alternative interpretation for the latter. I challenged the use of uniformitarian and evolutionary sequences that claim the sediments become older the farther away from the mid-ocean ridges. I added more information on the problematic plate tectonic interpretation of Wadati-Benioff zones, providing an alternative hypothesis. 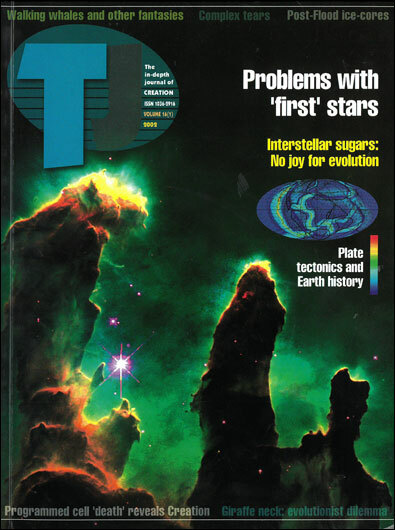 Further aspects of the catastrophic plate tectonics model were questioned, reminding the reader that it is just a model, although elegant, and subject to the limitations of models. This third and final submission has addressed Baumgardner’s challenges from his second submission. I added a little more information, emphasizing the many uniformitarian assumptions, to what Baumgardner believes is such compelling evidence from the ocean floor for plate tectonics. I provided brief comments on several specific aspects of plate tectonics. I commented on several unique aspects of catastrophic plate tectonics, such as the character of trenches, the heat problem, and pre-Mesozoic plate tectonics. I defended my alternative suggestions, admitting that I do not yet have a mechanism and for the purposes of this forum do not need a mechanism. I have tried to bring into the discussion newer data for a more complete data set. Much of this data are reinterpreted within the plate tectonics paradigm, minimized or ignored. I also have attempted a reinterpretation of this data. I may be reading between the lines too much, but it is my impression that Baumgardner is unaware of much of the data inimical to plate tectonics and is unable to see alternative interpretations than plate tectonics. I certainly do not expect the ‘Earth-science community’ to agree with my interpretation of the data. I believe that catastrophic plate tectonics within creationist circles is a viable Flood model within the principle of multiple working hypothesis, but I do not believe that the Flood mechanism has been solved. Baumgardner has to fill in many more details of Earth history and justify his assumptions. I thank John Reed, Peter Klevberg, John Woodmorappe, Carl Froede, and Chris Bennett for many helpful comments during this forum. Michael J. Oard has an M.S. in atmospheric science from the University of Washington and is now retired after working as a meteorologist with the US National Weather Service in Montana for 30 years. He is the author of the monographs An Ice Age Caused by the Genesis Flood and Ancient Ice Ages or Gigantic Submarine Landslides? He serves on the board of the Creation Research Society. Thiede, J., Reworking in Upper Mesozoic and Cenozoic central Pacific deep-sea sediments, Nature 289:667–670, 1981. Return to text. Woodmorappe, J., An anthology of matters significant to creationism and diluviology: report 2; in: Woodmorappe, J., Studies in Flood Geology, Institute for Creation Research, El Cajon, pp. 87–94, 1999. Return to text. Mpodozis, C. and Ramos, V., The Andes of Chile and Argentina; in: Ericksen, G.E., Pinochet, M.R.C. and Reinemund, J.A. (Eds), Geology of the Andes and Its Relation to Hydrocarbon and Mineral Resources, Circum-Pacific Council for Energy and Mineral Resources, Houston, pp. 59–90, 1990. Return to text. Hutton, D.H.W., The ‘space problem’ in the emplacement of granite, Episodes 19(4):114–119, 1996. Return to text. McCaffrey, K.J.W. and Petford, N., Are granitic intrusions scale invariant? J. Geological Society, London 154:1, 1997. Return to text. Barton, P.J., The relationship between seismic velocity and density in the continental crust—a useful constraint? Geophysical J. Royal Astronomical Society 87:195–208, 1986. Return to text. Christensen, N.I. and Mooney, W.D., Seismic velocity structure and composition of the continental crust: a global view, J. Geophysical Research 100(B7):9761–9788, 1995. Return to text. Koons, P.O., Modeling the topographic evolution of collisional belts, Annual Review of Earth and Planetary Science 23:397, 1995. Return to text. Paterson, M.S., Problems in the extrapolation of laboratory rheological data, Tectonophysics 133:33–43, 1987. Return to text. Paterson, S.R. and Tobisch, O.T., Rates of processes in magmatic arcs: implication for the timing and nature of pluton emplacement and wall rock deformation, J. Structural Geology 14(3):291, 1992. Return to text. Oard, M.J., Literature criticisms of plate tectonics; in: Reed, J.K. (Ed. ), Plate Tectonics: A Different View, Creation Research Society Monograph 10, St Joseph, pp. 44–45, 2000. Return to text. Hieronymus, C.F. and Bercovici, D., Non-hotspot formation of volcanic chains: control of tectonic and flexural stresses on magma transport, Earth and Planetary Science Letters 181:542, 2000. Return to text. Stevenson, A.J., Scholl, D.W. and Vallier, T.L., Tectonic and geologic implications of the Zodiac fan, Aleutian Abyssal Plain, northeast Pacific, Geological Society of America Bulletin 94:259–273, 1983. Return to text. Carey, S.W., Theories of the Earth and Universe—A History of Dogma in the Earth Sciences, Stanford University Press, Stanford, pp. 184–186, 1988. Return to text. Oard, M.J., Subduction unlikely—plate tectonics improbable; in: Reed, Ref. 11, p. 96, Figure 3. Return to text. Oard, Ref. 15, p. 102. Return to text.